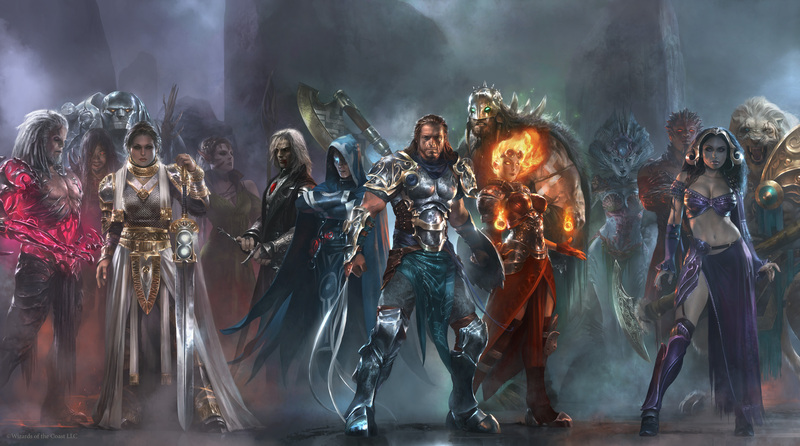 From left to right: Tezzeret, Sarkhan Vol, Karn, Elspeth, Nissa, Sorin Markov, Jace, Gideon Jura, Chandra Nalaar, Garruk, Kiora, Koth, Liliana, Ajani. PS – the Merfolk Planeswalker inbetween Garruk and Liliana is Kiora Atua (blue/green). Just thought id mention that since ive seen a lot of folks asking. Theres also a lot of folks asking about Venser and Nicol Bolas. As far as I know Venser is dead (died helping free Karn I believe), as for Nicol? Ajani is the coolest of them all, i wish brad rigney wil make a solo graphic art of him.